BRIGSBY BEAR is a heartwarming dark comedy that melds NAPOLEON DYNAMITE with ROOM and BE KIND REWIND! It's about a young man called James (Saturday Night Live's Kyle Mooney) who is returned to his family after being abducted as a child and raised by a couple of kranks. He struggles to adjust to reality and misses the cocooned world he lived in, most specifically the fake TV show his fake dad (brilliantly/manically played by Mark Hamill) created called Brigbsy Bear. James is shocked that no-one else is ingrained in the TV shows mythos but with the help of a friendly cop (Greg Kinnear) and his newfound high school friends, he manages both to recreate the show and come to a kind of emotional acceptance of his past. 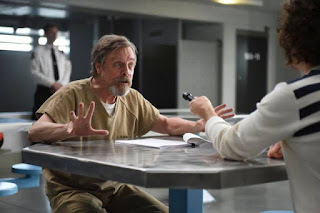 The film is laugh out loud funny and goofy and features a truly brilliant cameo from Hamill. But beyond that I found it to be a particularly insightful and wry take on modern internet fuelled fandom, and the kind of "fake nostalgia for an unremembered 80s" that South Park so brilliant satirised with its "memaberries" plot line. James watches old shows on meticulously labelled VHS tapes and discusses them in online forums with fake friends his fake parents made up. He even has fake faded fan T-shirts. The way in which the school kids who didn't grow up with Brigbsy take to him also speaks to the current way in which new generations get immersed in a self-consciously old-school lo-fi pop cultural past. BRIGSBY BEAR has a running time of 97 minutes and is rated PG-13. The film played Sundance, Cannes and London 2017. It opened earlier this year in the USA, Canada, Australia and the Netherlands, and earlier this month in the UK and Ireland.